We lose 1% of collagen per year after the age of 29. Collagen is broken down daily by the sun and free-radical damage. 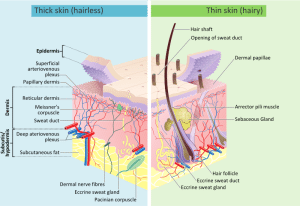 Young skin sheds cells about every 30 days and older skin sheds every 60 days. Moisturizers attract water molecules plumping up dehydrated skin and making wrinkles less noticeable. The needs of your skin, including hydration and moisturizing, will change from time to time and as you age. Skincare products and cosmetics don’t last forever. Check expiration dates and keep out of sunlight. Despite popular belief, dry skin does not cause wrinkles, though it can make all lines and wrinkles appear worse. Moisturizers are only a temporary fix. Gravity, aging, and sun exposure will do their damage anyway. Exfoliating with pits and crushed seeds is not the answer. If the substance is too rough it will create micro-tears in your skin. How you sleep affects your age. Sleeping on your back is the best way to minimize wrinkling on your face and neck. New research suggests that we accumulate 10% of sun damage with each passing decade. The sun does penetrate window glass, so keep sunscreen handy all year round. Make reapplying your sunscreen a ritual. Taking two aspirin immediately after sun exposure will help prevent a sunburn from developing. Acne plagues the average sufferer for seven years and adult women often for 20 years or more. Approximately 40% of people from the age of 20 to 60 suffer from adult blemishes, breakouts, and acne. A pimple is weeks in the making; the pimple you see today cannot be a direct result of the chocolate you ate yesterday. If you have facial redness, rosacea, or broken capillaries, saunas, steam baths, coffee, wind, and alcohol will only irritate the skin further.